After my many visits to Crete, I am often asked about the Church in Crete, and how it related to the Greek Orthodox Church. However, the Church of Crete is a very unique Church and has closer links with the Ecumenical Patriarchate of Constantinople that with the Church of Greece. The canonical territory of the Church of Greece (Ἐκκλησία τῆς Ἑλλάδος) is confined to the borders of Greece prior to the Balkan Wars of 1912-1913. This means the rest of Greece, including Thessaloniki, the Dodecanese and Crete are part of the jurisdiction of the Ecumenical Patriarch of Constantinople. In practice, most of these dioceses are administered as part of the Church of Greece under an agreement between the Archbishop of Athens and the Patriarch of Constantinople. However, the Church of Crete (Εκκλησία της Κρήτης), as well the dioceses in the Dodecanese such as Rhodes and Samos, and the Monastic Republic of Holy Mount Athos, stand apart. They remain under the direct jurisdiction of the Patriarch of Constantinople, and have never become part of the Church of Greece. The Church of Crete in particular enjoys semi-autonomous status. New bishops are elected by the Holy Synod of Crete, and the Archbishop is appointed by the Ecumenical Patriarch from a three-person list drawn by the Greek Ministry of National Education and Religious Affairs from among the serving Metropolitans or Bishops of Crete. 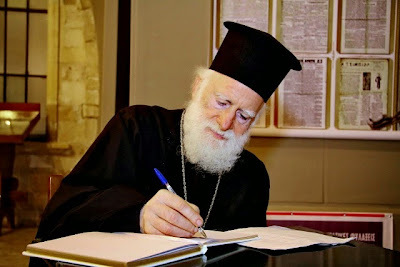 The Church of Crete covers the whole island of Crete and the current Archbishop of Crete, since 30 August 2006, is Archbishop Irinaios Athanasiadis. The Church of Crete is rooted in the Apostolic Church, for Christianity came to Crete during the Apostolic era The Acts of the Apostles record that people from Crete were present in Jerusalem when the Apostle Peter was preaching at Pentecost (see Acts 2: 11). Later, about the year 64, Saint Paul appointed his disciple Saint Titus to lead the preaching of the Gospel among the heathens on Crete as the first bishop of the island. Ten Christians were martyred in Crete during the reign of Emperor Decius (249-251) and are remembered on the island as kallinikoi martyres. As the Church grew in Crete, a synod of bishops, headed by an archbishop, was established and this became one of the 12 archdioceses in the Balkan region or Illyria. The episcopal succession after Saint Titus is largely forgotten. But in the second century, Philippos is mentioned as a bishop, and Cyril and Eumenios are recorded as later Bishops of Gortyna. Under the Roman Empire, the city of Gortyna was the civil administrative centre of the island and the seat of the Archbishop of Crete. In the sixth century, probably during the reign of Justinian, a basilica was built in Gortys in honour of Saint Titus. At the beginning of the eighth century, there were 12 bishoprics in Crete, which was called “the twelve-throne island.” But the in these early centuries, the number of dioceses in Crete fluctuated between 12 and 20. During the iconoclast controversy in the eighth century, Saint Andrew of Jerusalem was Archbishop of Crete and maintained Orthodoxy on the island. He was one of the great figures in the Byzantine Church, a renowned public speaker and hymn-writer, who led the Church of Crete for almost 30 years (712-740). He was succeeded by Archbishop Elias, who took part in the Seventh Ecumenical Council in 787 with the bishops of Crete: Epiphanios of Lambi, Theodore of Iraklion, Anastasios of Knossos, Meliton of Kydonia, Leon of Kissamos, Theodore of Souvrita, Leon of Phoenix, John of Arcadia, Epiphonios of Eleftherna, Foteinos of Kandanos, and Sissinios of Herronissos. In the mid-ninth century, when Crete was invaded and occupied by Arabs who established their capital at Candia (present-day Iraklion), Crete was separated from the Eastern Roman Empire and the Church of Constantinople for a century and a half and for the next 150 years we know little about church life on Crete. Although the Ecumenical Patriarchate continued to consecrate bishops for Crete, these bishops lived outside Crete and their titles were titular. In 961, the Byzantine general Nicephorus Phocas recaptured Crete, and the island remained a part of the Eastern Roman Empire until the Venetian invasion of 1204. Candia (Iraklion) remained the capital of Crete and became the seat of the Archbishop of Crete. Under the Ecumenical Patriarchate, the Church on Crete was designated a metropolis, and the Church was headed by the Metropolitan of Crete, who was assisted by 12 bishops. A new cathedral was built in Candia, dedicated again to the Apostle Titus and probably on the site of the present-day Church of the Apostle Titos. The names of these metropolitans or archbishops included Elias in the 11th century, John (12th century, and Nicholas. With the Venetian invasion in 1204, Metropolitan Nicholas fled to Nicaea, with Bishop Gregory of Petra and Bishop John of Arcadia, but Bishop Paul of Knossos and the unnamed bishops of Herronissos and Agrion remained on Crete. The Venetians ruled Crete from 1204 to 1669. Orthodox bishops fled, and the Church of Crete was reorganised on the Latin model, with a Roman Catholic archbishop and bishops. But despite having no bishops, the Greek-speaking people remained loyal to Orthodoxy, their faith was sustained by the monasteries and monks, and by the ordinary priests in the villages and towns, and the Patriarchs of Constantinople continued to appointed archbishops in exile who could never live in Crete. These nominal archbishops included Nikiforos Moschopoulos (ca 1285-1322) and Anthimos, Metropolitan of Athens (died 1371), who both held the title of President of the Church of Crete. The hard-working theologian and preacher, John Vriennios, remained in Crete for about 20 years (1381-1401), sustained the Orthodox faith in the island and debated with Roman Catholic theologians of his time, including Maximos Chrissovergis and Demetrios Kidonis. The Turkish occupation of Crete from 1645 brought further changes to the life of the Church of Crete. The Ottomans placed the Christians of Crete under the authority of the Patriarch of Constantinople, who became responsible to the Sultan for the life of Christians on Crete. When Neophytos Nikousios, a monk from the Monastery of Arkadi, was consecrated Metropolitan of Crete in 1647, he was the first Orthodox Bishop of Crete since the Venetians captured the island in the early 13th century. During the Turkish occupation, the number of bishops and dioceses varied from 10 to 12, and they maintained their historic names: Gortyna, Knossos, Arcadia, Herronissos, Avlopotamos, Agrion (Rethymnon), Lambi, Kidonia, Iera, Petra, Sitia, and Kissamos. Until 1821, the Metropolitan of Crete also had an assistant bishop whose title was Bishop of Diopolis. In 1700, the Metropolitan of Crete gained a new title and became known as the Metropolitan or Archbishop of Crete and All Europe. However, the Metropolitan was without a cathedral, and had to make use of the Church of Saint Matthew on Candia (Iraklion), which belonged to the Monastery of Sinai. After a lengthy and difficult struggle with the Ottoman authorities, Metropolitan Gerasimos Letitzis built the small Church of Saint Minas as his cathedra in Iraklion. The church was consecrated on 10 November 1735, and officially became a cathedral on 19 June 1742. Meanwhile, the Ecumenical Patriarchs used their influence at the Ottoman court to bring many of the monasteries in Crete under their direct protection as stavropegic monasteries, or monasteries protected by the True Cross, including Arkadi, Arsanios and Preveli. After a popular revolt, the Turks retaliated with a massacre in Irkalion on 24 June 1821, and the victims included Metropolitan Gerasimos Pardalis and five of his bishops: Neofitos of Knossos, Joachim of Herronissos, Ierotheos of Lambis, Zacharias of Sitia and Kallinikos, and the titular Bishop of Diopolis. The Church of Crete was left without a metropolitan for the two years until 1823, when Kallinikos of Anchialos was consecrate Metropolitan of Crete. At the same time, the Bishopric of Knossos was abolished and became part of the metropolis. During the time of Metropolitan Meletios I Nikoletakis (1830-1834), the structure of the Church of Crete saw great changes, and the dioceses were merged to form five bishoprics. In 1862, however, most of the historic dioceses were re-established, apart from Knossos, which remained part of the metropolis. In the 1860s, Metropolitan Dionissios Chanritonides began building a new, larger Cathedral of Saint Minas in Iraklion. The cathedral was completed and consecrated on 18 April 1895, under Metropolitan Timotheos Kastringannakis (1870-1898), the last Metropolitan to hold office under Turkish rule. The Church of Crete, which has been self-governing since late Ottoman times, has continued to retain that status. After Turkish rule came to an end in 1898 and after Crete was incorporated into the modern Greek state in 1913, new laws were passed in Crete in 1900, and later in Greece in 1961 (Law 4149/1961) settling the legal status of the Church of Crete. Under these laws, the Bishopric of Herronissos became part of the Metropolis of Crete, and the Metropolitan of Crete was elected by the Ecumenical Patriarchate with confirmation by the Greek State. In 1962, the Ecumenical Patriarch gave all the bishops in Crete the dignity of metropolitan, and on 28 February 1967 the Patriarch made the Metropolis of Crete an Archdiocese with an Archbishop. The title “Archbishop of Crete and all Europe” remains an official title that is still borne today. The Patriarch nominates the Archbishop of Crete from a list of three bishops in Crete put forward by the Greek Ministry of National Education and Religious Affairs. However, the affairs of the Church, including the nomination of the other bishops, are managed by the Holy Provincial Synod of Crete. ● The Metropolis of Arkalochori, Kastelli and Viannos, based at Arkalochori, HE Metropolitan Andreas of Arkalochoni, Kastellos and Biannos, Exrach of Pediados.